In 1953, 26-year-old architect Tim Seibert worked in Paul Rudolph's architecture practice designing the Hiss Studio, which served as an office for Lido Shores developer Phillip Hiss. 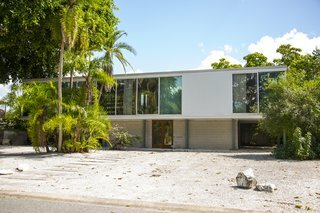 During this time, Paul Rudolph was designing the Umbrella House next door. The Studio, designed as a glass box set on 14 slender steel columns, was one of the first air-conditioned buildings in Sarasota. Its crowning glory is its grand library, an enormous room which occupies most of the second floor. It has the original oak shelving that contained Hiss’ enormous library of art books, along with an original brass chandelier and natural cork flooring. The spiral stairway connects it to the ground floor. In 1962, Bert Brosmith designed the 5,252 square foot ground floor addition that contains four bedrooms, four baths with a kitchen, dining and living area all opening directly to the outside and indirectly lit by 33 skylights. uploaded Hiss Studio through Add A Home.